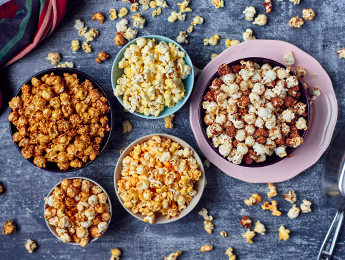 Check Out These Popcorn Topping Recipes! Preheat oven to 325ºF. Pop popcorn; place in a large bowl and set aside. In a small saucepan over medium-high heat, add honey; bring to a boil for 1 minute. Remove from heat and quickly whisk in almond butter until mixture is smooth. Quickly pour over popcorn and mix with a spoon until well coated. Spread out on a large baking sheet with sides and bake for 5 minutes, stirring often. Cool on a wire rack before serving.